Click here to find out how to update. Improved support for Excel 2013, 2016, 2019, Office 365 and Windows 10. Changed this website and the online software activation used by ActiveData to use secure https:// on port 443. This required a change to how the software handles online activation. Older versions of ActiveData now report "No response received" when attempting to activate the software. ActiveData For Excel Version 5.0.505 October 2014 Click here for more details and screen shots. Added the "Quick Filter" command to Excel's context menu. This filters the current sheet using the value in the selected cell(s). Added the "Quick Summary" command to Excel's context menu. This summarizes the worksheet using the current Excel column as the Group-By field. Added the "Quick Find" command to Excel's context menu. This lets you search all open sheets for the value in the current cell. This command also supports fuzzy (Levenshtein distance) matching. Added the "Range Math" command to Excel's context menu. This allows you to add, subtract, multiply and / or divide the selected cells by themselves. Added the "Copy Row(s) To Sheet" command to Excel's row context menu (the menu you get when you right-click a row number on the left hand side of Excel's grid). This lets you copy the selected rows to the end of another (or new) sheet. Added the "Word Summary" command to Excel's context menu. This combines all of the text from the highlighted cells, breaks it up into words and then produces a summarization listing each word encountered and the number of occurances. Added "Create Rightmost Column" option to Split Columns -> Text Columns. This captures the rightmost word from the original column. 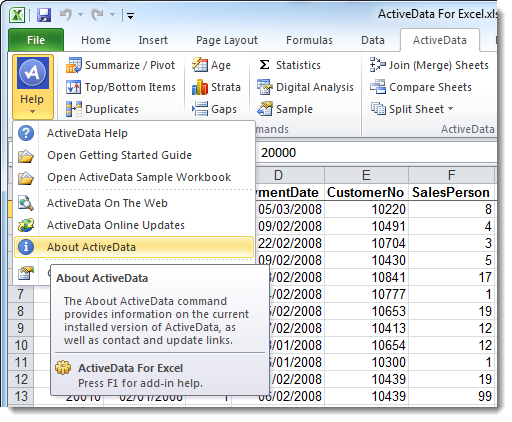 ActiveData For Excel Version 5.0.504 January 2013 Click here for more details and screen shots. Supports Excel / Office 2013. The "Rows -> Tag Rows" menu has been moved to its own top level menu on the ribbon. Row tagging now supports user defined tags in addition to a simple + sign. Added the "Combine Tagged Rows" command to combine multiple rows based on tag type. "Tag Rows By Column Value" now supports regular expressions The "Import -> Import ODBC Tables" command now supports the use of a Where command to specify which rows to import. The "Cells -> Convert Selected Cells" drop-down menu has been replaced with a floating dialog with a preview function. Added the new Worksheet menu Added the "Combine Sheets" command to the new Worksheet menu. Moved the "Duplicate Sheet" command to the new Worksheet menu. Moved the "Cells -> Format Sheet" command to the new Worksheet menu. Moved the "Sort To Sheet" command to the new Worksheet menu. Added the "Add Row #" command to the "Columns -> Arrange Columns" dialog. Added "Remove Blank Columns" to the Columns menu. Added "Remove Blank Rows" to the Rows menu. Added "Duplicate Column" to the Columns menu. Added "Duplicate Row" to the Rows menu. Added "Insert N Columns" to the Columns menu. Added "Insert N Rows" to the Rows menu. The "Columns -> Column Properties" command has been renamed and moved to "Cells -> Selected Cell Properties". The new "Columns -> Column Properties" command analyzes all of the columns in the worksheet and highlights potential problems including blanks and mixed data type issues (text cells mixed with numeric cells). The "Workbook Navigator" has been redesigned. Updates are free to users with current support or who are currently running version 5. To update your version of the software, uninstall your current version and then download and install the latest version. Reactivation is not required. Instructions and download links can be found HERE. Updates are free to users with current support. To purchase or renew support, login to your account, locate your ActiveData for Excel® software purchase and click the "Add / Renew Support" link. Your account number and password were emailed to you when you purchased. If you have misplaced the original message then please let us know and we'll resend the information to you.